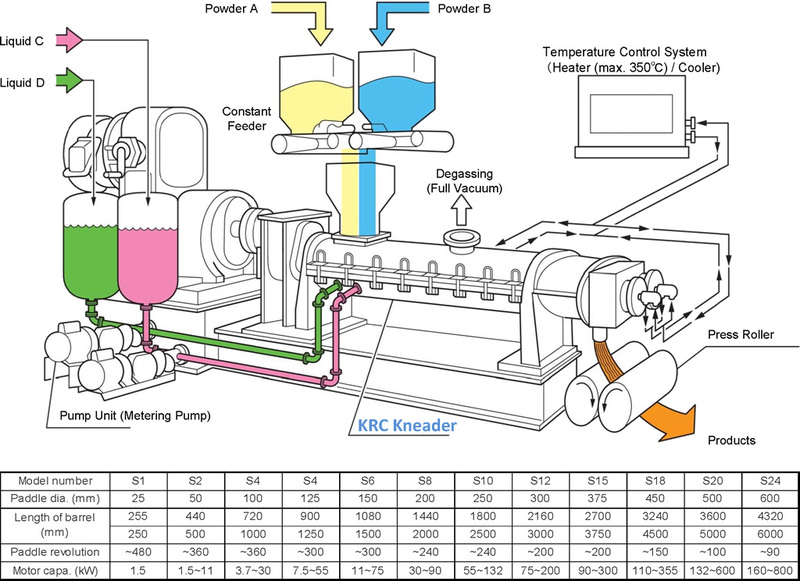 KRC Kneader -Twin Screw Continuous Kneader / Reactor- | Product Information | KURIMOTO, LTD.
KRC Kneader is ideally suited for operations involving mixing, kneading, reaction, polymerization, crystallization, compounding and heating or cooling of materials up to many million centipoise viscosity. 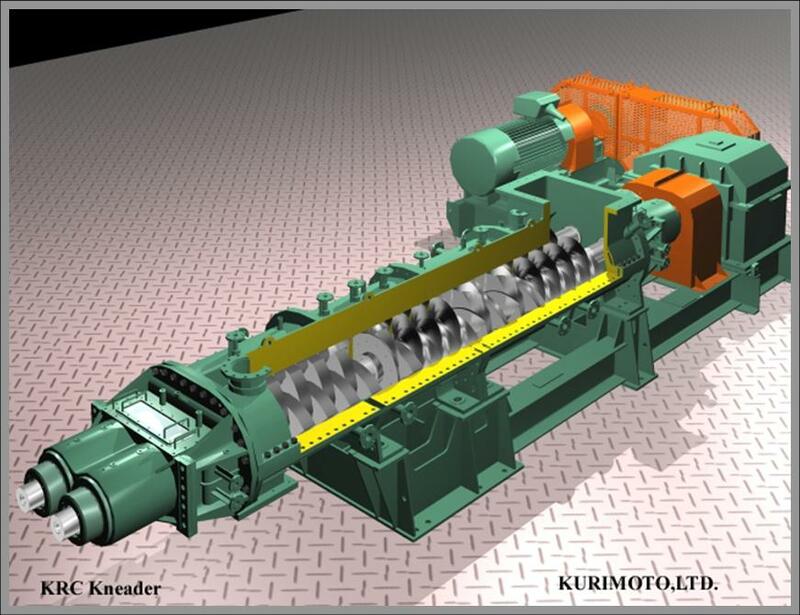 Kurimoto KRC Kneader is a horizontal, twin screw, closed type continuous kneading/reacting processor. KRC Kneader has more than 1,100 sets of delivery track records. And the KRC Kneader has a number of recent successful accomplishments as continuous polymerization / reacting processor for engineering plastics and others. 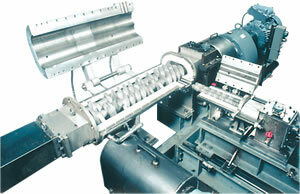 Compared to twin screw extruder, KRC Kneader has compact structure such as short L/D and low power while having equivalent kneading and dispersion performance and contributing to rationalization of manufacturing process and cost reduction. Especially KRC Kneader offers several advantages over batch mixing. If required longer residence time and higher production capacity, Hybrid Reactor (continuous reactor, plug-flow) is available. Compression and elongation action accompanying rotation of paddle and shearing action with narrow clearance provide improvement kneading and dispersion effect. The paddles can be changed individually. Therefore the optimum paddle arrangement pattern can be selected according to the application and purpose. These selections of paddle arrangement enable the Kneader to control residence time and axial pressure distribution of the materials. The co-rotating shafts and close clearances between paddles and between the paddles and barrel walls provide efficient uniform mixing. This prevents material build up inside the barrel and results in a self-wiping action. The barrel which is horizontally split as standard design is easy to open for disassembling and cleaning in short time compared with Extruder. Volume of material is changed in compression and expansion according to paddle's rotation.Shearing actions between the barrel and paddle, and between paddles increases efficiency of kneading and dispersion. Lab test and pilot test can be performed. Typically in one to three days of testing, feasibility can be proven and the machine can be configured to suit the specific product and mixing needs.